The University of Connecticut (UConn) has created and implemented a variety of wrap-around support services to assist minority students on its campus. Of the 23,845 undergraduates in attendance at UConn, 51 percent are female and 33 percent are minority students, according to college officials. For the 8,337 graduate students, 53 percent are female, while 19 percent are minority. 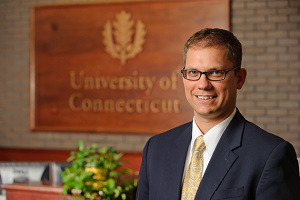 “We are always working to attract a student body that reflects the breadth of diversity and backgrounds across society,” says Nathan Fuerst, the vice president for enrollment planning and management at UConn. On average, the freshman retention rate for minority students is 92 percent, compared to the rate of 94 percent for overall students. In addition, the four-year graduation rate among minority students is 66 percent, while the six-year graduation rate for minority students is 77 percent, according to UConn’s 2018 fact sheet. For Dr. Maria D. Martinez, who is the assistant vice provost of the Institute for Student Success at UConn, the two words, “intentional” and “collaboration,” came to mind when she thinks about the evolution of graduation and retention of minority students. “Quite a few years ago, we as an institution realized that unless we are collaborating and unless we looked at intentional programming, that we were not going to get very far,” says Martinez. The effort, college officials say, has been a priority. “We don’t have any specific numbers or targets with regard to student diversity but we do have ambitions to drive up our retention and graduation rates, even higher beyond where they are,” says Fuerst. Martinez believes that UConn’s success also stems from working with the local communities across the state and beyond, where students live. For example, UConn has an initiative that focuses on the neighboring city of Hartford. Since 2016, the university has offered $5,000 in scholarship money on a yearly basis to all graduates from Hartford public schools who enroll at UConn and are participants in the scholarship program, Hartford Promise. To qualify for the Hartford Promise program, a student must maintain a 3.0 GPA or higher, hold at least a 93 percent cumulative attendance record during high school, be a Hartford resident throughout high school and attend a Hartford public school for all four years. As part of an initiative to help first-generation, low-income and underrepresented minority students during the college transition process, UConn created Student Support Services. Students participate in the five-week summer program where they are given insight into UConn’s academics. In addition, counselors are assigned to students who provide them with support throughout their entire undergraduate experience. On campus, UConn offers learning communities that are either based on an interdisciplinary topic or student’s major. Those who are involved in the communities develop knowledge about the specific subject and participate in guided courses. More than 40 percent of first-year students participate in the learning communities, UConn’s website stated. “At the beginning, we didn’t think it was going to be a key element in diversity,” says Martinez. However, around 42 to 43 percent of students enrolled in the learning communities are underrepresented minorities, according to Martinez. In addition, the communities are open to anyone and not just first-year students. The ScHOLA²RS House is one of the learning communities on campus. It targets African-American students who are interested in being faculty members, researchers or lawyers. Its goal is to “increase the retention and persistence of students using educational and social experiences to enhance their academic success at UConn and beyond in graduate and professional school placement,” according to the program’s website. There are almost 20 learning communities which focus on subjects such as sustainability, innovation, leadership, fine arts, engineering and public health. In addition, there are five cultural centers on campus including the African-American Cultural Center, Asian American Cultural Center, Puerto Rican/Latin American Cultural Center, Rainbow Center and Women’s Center. This article appeared in the August 23, 2018 edition of Diverse and is the last in a series of profiles about some of the institutions that made our Top 100 list.